I started this blog/ style experiment knowing it was going to be a learning process- complete with growing pains. Yesterday was a perfect example of that- and I truly appreciate all the feedback! One thing I’ve learned over the last few months is to ‘go with my gut’. I knew that outfit yesterday wasn’t that great- but I was in a rush and decided what the heck- maybe it’s cuter than I think? Clearly I was wrong! Too see why, read the comments, there are some smart gals out there! Thanks! Another thing I’m learning is that some trends work for some people and not for others, and when something works for me- stick to it! I happen to love skinny bottoms and neutral tops- that’s what works for me. On the other hand though, I am trying to grow and take a few small risks- sometimes that works, sometimes it doesn’t! So that brings me to today’s outfit- I decided to go with something I knew worked and something that I knew I loved- this dress! I’m taking that outfit and then adding a small risk. Last time I wore this dress I paired it with a brown belt and brown boots. 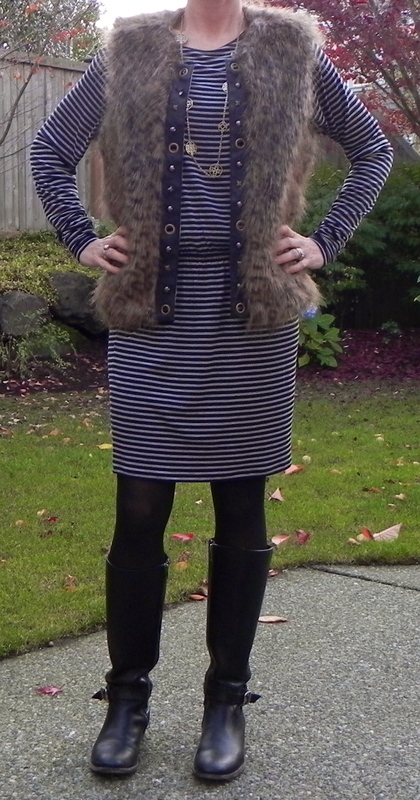 Today I decided to go with black boots, a necklace and my faux fur vest. I think it makes for a cute change and I feel great. All in all, that’s what fashion and style are all about- feeling comfortable in what you’re wearing and owning your look! Notice the change in boots? In the small picture above I have on high heel pointy boots- but since I'm going to be on my feet all day, I'll wear flats instead. Not as fashionable, but REAL! I think the flat boots work well because it offsets the “glam” factor of the vest a little…the pointy boots work too but these boots give it another unexpected twist and double points for being practical!!! Thanks! I think you’re right, since this is a daytime look- the flat boots are a great way to take it down a notch. Maybe for the evening I’d go with the heels! I appreciate the comment! That vest is just fabulous! You look super cute! I like the flat boots too. And I agree, some trends just aren’t for everyone. i love this outfit!!! that dress is soooo slimming and i absolutely love it with the fur vest. i do prefer the pointy heels – maybe a short bootie (with a low heel) may be a compromise? ?